The National Campaign Against Fees and Cuts (NCAFC) is supporting the campaign to free jailed Iranian trade unionist Shahrokh Zamani. 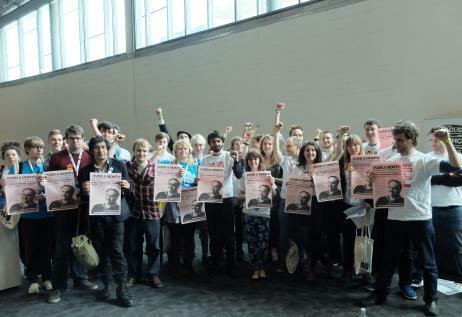 Just as we support students and workers’ struggles everywhere in the world, we stand in solidarity with those fighting to build independent trade unions and student organisations in Iran – both have faced massive repression from the Iranian state. The following statement, initiated by NCAFC supporters, has been signed by student officers and activists from across the country, including almost half of the National Union of Students national executive. We’ll be sending it to the press soon as a letter. If you’d like to add your name, emailshreya.paudel2010@gmail.com or leave a comment below. For the online petition which has been signed by hundreds of students across the country, see here. We the undersigned student union officers and student activists demand the release of imprisoned Iranian trade unionist Shahrokh Zamani, who has just ended a hunger strike of over forty days and whose health is seriously deteriorating. He has been in prison since 2011 for the crime of seeking to build independent unions in Iran. James Elliott, NUS NEC Disabled Students Member-elect. To sign email shreya.paudel2010@gmail.com or leave a comment below. This entry was posted in Uncategorized and tagged anticuts, free education, NCAFC, NUS. Bookmark the permalink.